CBA top team - Guandong Tigers (15-0) had no problems winning another game on Thursday. This time they crushed fifteenth ranked Brave Dragons (4-11) in Taiyuan 137-115. Guandong Tigers made 36-of-40 free shots (90.0 percent) during the game, while Brave Dragons only scored twenty points from the stripe. Guandong Tigers looked well-organized offensively handing out 23 assists. 28 personal fouls committed by Brave Dragons helped opponents get some easy free throw opportunities. Worth to mention a great performance of American swingman Sonny Weems (198-86, college: Arkansas) who helped to win the game recording 25 points, 6 rebounds and 8 assists (made all of his seven free throws). The former international Jianlian Yi (212-87) contributed with 30 points and 8 rebounds for the winners. American Shabazz Muhammad (198-92, college: UCLA) replied with a double-double by scoring 32 points, 14 rebounds and 5 assists for Brave Dragons. The winner was already known earlier in the game, so both coaches allowed to play the bench players saving starting five for next games. Undefeated Guandong Tigers have an impressive 15-game winning streak. They maintain first position with 15-0 record. Brave Dragons lost fifth consecutive game. They keep the fifteenth place with 11 games lost. They share the position with Qingdao E.. Guandong Tigers are looking forward to face Sharks (#3) in Shanghai in the next round, which may be the game of the day. Brave Dragons will play on the road against Xinjiang Flying Tige (#6) in Urumqi and are hoping to prove to their fans that they can break losing series. Important game to mention about took place in Changchun. Eleventh ranked Sturgeons (8-7) saved a 3-point victory on the road edging 12th ranked Jilin Tigers (6-8) 104-101 on Friday evening. Worth to mention a great performance of international Zhelin Wang (214-94) who helped to win the game recording a double-double by scoring 24 points and 13 rebounds and Andrew Nicholson who added 24 points and 11 rebounds during the contest. Sturgeons' coach ShiLong Zhu allowed to play the deep bench players in such tough game. At the losing side American guard Dominique Jones (193-88, college: S.Florida) responded with a double-double by scoring 23 points, 8 rebounds and 11 assists. Sturgeons moved-up to tenth place, which they share with Guangzhou LL. Jilin Tigers at the other side keep the twelfth position with eight games lost. Sturgeons will play against bottom-ranked Gold Lions (#20) in Tianjin in the next round and are hoping to win another game. Jilin Tigers will play at home against Eagles (#16) and hope to get back on the winning track. The game between ninth ranked Leopards (10-5) and 8th ranked Golden Stars (9-6) in Shenzhen on Friday ended with biggest points difference. Leopards outscored guests from Jinan 116-91. The winners were led by Kenny Boynton who scored that evening 27 points, 9 rebounds and 5 assists. Leopards' coach Jianjun Wang felt very confident that he used entire bench which allowed the starters a little rest for the next games. Even a double-double of 28 points, 14 rebounds and 6 assists by Donatas Motiejunas did not help to save the game for Golden Stars. Leopards moved-up to sixth place, which they share with Xinjiang FT. Loser Golden Stars dropped to the ninth position with six games lost. Leopards will meet Bayi Rockets (#17) in the next round which should be another easy win for them. Golden Stars will play against Fly Dragons (#19) and hope to secure a win. Other games in round 16 were not that significant. Shanghai S. beat Qingdao E. on the road 114-107. Xinjiang FT won against Bayi R. on its own court 111-96. Jiangsu D. unfortunately lost to Zhejiang Ch. in Hangzhou 96-113. Liaoning FL managed to beat Guangzhou LL at home 117-101. Beijing Dragons was defeated by Nanjing TX MK on the opponent's court 117-110. Guangzhou LL smashed Jilin NE T. in a home game 129-109. Beijing Ducks won against Qingdao E. on the road 107-92. Shandong GS managed to outperform Bayi R. on its own court 97-86. Beijing Ducks managed to beat Sichuan BW in a road game 87-73. Guangsha L. crushed Tianjin GL at home 125-103. The most impressive performance of 16th round was 26 points, 24 rebounds, 5 assists and 5 steals by Cole Aldrich of Tianjin GL. Important game to mention about took place in Changchun. Eleventh ranked Sturgeons (8-7) saved a 3-point victory on the road edging 12th ranked Jilin Tigers (6-8) 104-101 on Friday evening. Worth to mention a great performance of international Zhelin Wang (214-94) who helped to win the game recording a double-double by scoring 24 points and 13 rebounds and Canadian Andrew Nicholson (206-89, college: St.Bonaventure) who added 24 points and 11 rebounds during the contest. Sturgeons' coach ShiLong Zhu allowed to play the deep bench players in such tough game. At the losing side American guard Dominique Jones (193-88, college: S.Florida) responded with a double-double by scoring 23 points, 8 rebounds and 11 assists and Polish-Swedish power forward Maciej Lampe (211-85) scored 26 points and 8 rebounds. Both teams had four players each who scored in double figures. Sturgeons moved-up to tenth place, which they share with Guangzhou LL. Jilin Tigers at the other side keep the twelfth position with eight games lost. Sturgeons will play against bottom-ranked Gold Lions (#20) in Tianjin in the next round and are hoping to win another game. Jilin Tigers will play at home against Eagles (#16) and hope to get back on the winning track. No shocking result in a game when fifth ranked Sharks (11-4) beat 15th ranked Eagles (4-11) in Qingdao 114-107 on Friday. The winners were led by American point guard Jimmer Fredette (188-89, college: BYU) who scored that evening 34 points (!!!) and 8 assists and Argentinian-Spanish power forward Luis Scola (206-80) supported him with 17 points, 7 rebounds and 4 assists (on 7-of-8 shooting from the field). Five Sharks players scored in double figures. Sharks' coach Qiuping Liu used a ten-player rotation which allowed the starters a little rest for the next games. Even a double-double of 47 points (!!! ), 11 rebounds and 4 assists by American point guard Jonathan Gibson (188-87, college: N.Mexico St.) did not help to save the game for Eagles. His fellow American import power forward Dakari Johnson (213-95, college: Kentucky) added 20 points, 12 rebounds and 4 assists for lost side. Sharks have a solid four-game winning streak. They moved-up to second place, which they share with Beijing Ducks and Liaoning FL. Loser Eagles keep the fifteenth position with 11 games lost. They share it with Shanxi Z.. Sharks will meet league's leader Guandong Tigers in the next round and it will be for sure the game of the week. Eagles will play against Jilin Tigers (#12) in Changchun and hope to secure a win. Very expected game when 17th ranked Bayi Rockets (3-12) lost to sixth ranked Xinjiang Flying Tige (10-5) in Urumqi 96-111 on Friday. Xinjiang Flying Tige made 16-of-18 free shots (88.9 percent) during the game. Strangely Bayi Rockets outrebounded Xinjiang Flying Tige 50-38 including 18 on the offensive glass. They looked well-organized offensively handing out 21 assists. Great defensive blocking was one of the keys in this match when Xinjiang Flying Tige made 7 blocks. The winners were led by American-Bulgarian point guard Darius Adams (188-89, college: Indianapolis, agency: IPZ) who scored that evening 42 points (!!! ), 5 rebounds and 8 assists and international Abudushalamu Abudurexiti (203-96) supported him with 19 points, 9 rebounds and 4 assists. Four Xinjiang Flying Tige players scored in double figures. Even a double-double of 19 points, 12 rebounds and 4 assists by international center Hao Fu (206-97) did not help to save the game for Bayi Rockets. International forward Haowen Guo (201-0) added 24 points for lost side. Both coaches used bench players which allowed the starters a little rest for the next games. Xinjiang Flying Tige maintains sixth position with 10-5 record, which they share with Shenzhen L. Bayi Rockets lost sixth consecutive game. They keep the seventeenth place with 12 games lost. They share the position with Sichuan BW and Beijing Dragons. Xinjiang Flying Tige will meet at home Brave Dragons (#15) in the next round and are hoping to win another game. Bayi Rockets will play against Leopards and hope to secure a win. Very predictable result when fifth ranked Golden Bulls (11-7) won against 13th ranked Jiangsu Dragons (6-9) in Hangzhou 113-96 on Thursday. Golden Bulls made 28-of-31 free shots (90.3 percent) during the game. Golden Bulls outrebounded Jiangsu Dragons 50-29 including a 35-22 advantage in defensive rebounds. The winners were led by American guard Marcus Denmon (191-90, college: Missouri, agency: BeoBasket) who had that evening a double-double by scoring 27 points, 12 rebounds and 9 assists and international guard Qian Wu (190-94) supported him with 27 points and 5 assists. Five Golden Bulls players scored in double figures. Even 34 points (!!!) by American guard Donald Sloan (190-88, college: Texas A&M) did not help to save the game for Jiangsu Dragons. Serbian center Miroslav Raduljica (213-88) added 24 points and 8 rebounds (on 7-of-9 shooting from the field) for lost side. Jiangsu Dragons' coach rotated eleven players seeing no chance for a win. Golden Bulls maintains fifth position with 11-7 record. Loser Jiangsu Dragons keep the thirteenth place with nine games lost. Golden Bulls' supporters look forward to an exciting derby game next round, where their team will face at home their local rival from Hangzhou Zhejiang Guangsha Lions. CBA top team - Guandong Tigers (15-0) had no problems winning another game on Thursday. This time they crushed fifteenth ranked Brave Dragons (4-11) in Taiyuan 137-115. Guandong Tigers made 36-of-40 free shots (90.0 percent) during the game, while Brave Dragons only scored twenty points from the stripe. Guandong Tigers looked well-organized offensively handing out 23 assists. 28 personal fouls committed by Brave Dragons helped opponents get some easy free throw opportunities. Worth to mention a great performance of American swingman Sonny Weems (198-86, college: Arkansas) who helped to win the game recording 25 points, 6 rebounds and 8 assists (made all of his seven free throws). 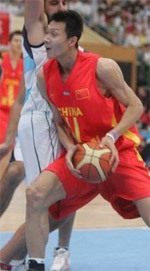 The former international Jianlian Yi (212-87) contributed with 30 points and 8 rebounds for the winners. American Shabazz Muhammad (198-92, college: UCLA) replied with a double-double by scoring 32 points, 14 rebounds and 5 assists and international forward Junwei Ren (203-90) added 22 points, 6 rebounds and 4 assists in the effort for Brave Dragons. Both teams had five players each who scored in double figures. The winner was already known earlier in the game, so both coaches allowed to play the bench players saving starting five for next games. Guandong Tigers have an impressive 15-game winning streak. They maintain first position with 15-0 record. Brave Dragons lost fifth consecutive game. They keep the fifteenth place with 11 games lost. They share the position with Qingdao E.. Guandong Tigers are looking forward to face Sharks (#3) in Shanghai in the next round, which may be the game of the day. Brave Dragons will play on the road against Xinjiang Flying Tige (#6) in Urumqi and are hoping to prove to their fans that they can break losing series. The game between ninth ranked Leopards (10-5) and 8th ranked Golden Stars (9-6) in Shenzhen on Friday ended with biggest points difference. Leopards outscored guests from Jinan 116-91. Leopards outrebounded Golden Stars 50-34 including 17 on the offensive glass. The winners were led by American point guard Kenny Boynton (188-91, college: Florida, agency: Higher Vision Sports) who scored that evening 27 points, 9 rebounds and 5 assists and the other American import forward Jared Sullinger (206-92, college: Ohio St.) supported him with 25 points and 13 rebounds. Leopards' coach Jianjun Wang felt very confident that he used entire bench which allowed the starters a little rest for the next games. Even a double-double of 28 points, 14 rebounds and 6 assists by Lithuanian power forward Donatas Motiejunas (213-90) did not help to save the game for Golden Stars. American guard Andrew Goudelock (190-88, college: Charleston) added 25 points and 4 assists for lost side. Five Leopards and four Golden Stars players scored in double figures. Leopards moved-up to sixth place, which they share with Xinjiang FT. Loser Golden Stars dropped to the ninth position with six games lost. Leopards will meet Bayi Rockets (#17) in the next round which should be another easy win for them. Golden Stars will play against Fly Dragons (#19) and hope to secure a win. Not a big story in a game when 10th ranked Long-Lions (8-7) lost to fifth ranked Flying Leopards (11-4) in Yingkou 101-117 on Friday. Flying Leopards outrebounded Long-Lions 53-37 including a 18-3 advantage in offensive rebounds. They looked well-organized offensively handing out 21 assists. The winners were led by American Lester Hudson (190-84, college: Tenn-Martin) who scored that evening 27 points and 6 rebounds and the other American import forward Brandon Bass (203-85, college: LSU, agency: IPZ) supported him with 23 points and 8 rebounds. Even 27 points, 6 rebounds and 6 assists by American point guard Kyle Fogg (190-90, college: Arizona) did not help to save the game for Long-Lions. Taiwanese point guard Ying-Chun Chen (183-93) added 25 points, 6 rebounds and 4 assists (made all of his seven free throws) for lost side. Five Flying Leopards and four Long-Lions players scored in double figures. Both coaches used bench players and allowed the starting five to rest. Flying Leopards have a solid four-game winning streak. Defending champion moved-up to second place, which they share with Beijing Ducks and Shanghai S. Loser Long-Lions keep the tenth position with seven games lost. They share it with Fujian S.. Flying Leopards will meet at home Monkey Kings (#14) in the next round which should be an easy win for them. Long-Lions will play against the league's second-placed Beijing Ducks (#2) and hope to secure a win. Everything went according to plan when sixteenth ranked Monkey Kings (5-10) defeated 19th ranked Fly Dragons (3-12) in Jiangsu 117-110 on Thursday. Monkey Kings made 21-of-25 free shots (84.0 percent) during the game. The winners were led by American guard Joseph Young (188-92, college: Oregon) who scored that evening 51 points (!!!) and point guard Xin Feng (187-92) supported him with 20 points and 7 assists. Five Monkey Kings players scored in double figures. Even 33 points (!!! ), 7 rebounds and 9 assists (made all of his twelve free throws !!!) by American point guard Pierre Jackson (180-91, college: Baylor) did not help to save the game for Fly Dragons. His fellow American import forward Shavlik Randolph (208-83, college: Duke) added 31 points and 9 rebounds for lost side. Both coaches used bench players and allowed the starting five to rest. Monkey Kings have a solid three-game winning streak. They moved-up to fourteenth place. Fly Dragons lost fifth consecutive game. They dropped to the seventeenth position with 12 games lost. They share it with Sichuan BW and Bayi R.. Monkey Kings will meet higher ranked Flying Leopards (#4) in the next round and they do not belong to the favorites in that game. Fly Dragons will play against Golden Stars (#9) in Jinan and hope to secure a win. There was no surprise when 12th ranked Jilin Tigers (6-8) were outleveled by tenth ranked Long-Lions (8-7) in Guangzhou 129-109 on Wednesday. Long-Lions made 27-of-31 free shots (87.1 percent) during the game. They looked well-organized offensively handing out 23 assists. The winners were led by American point guard Kyle Fogg (190-90, college: Arizona) who had that evening a double-double by scoring 43 points (!!! ), 7 rebounds and 10 assists (made all of his seventeen free throws !!!) and the other American import power forward Marreese Speights (208-87, college: Florida) supported him with 38 points (!!!) and 5 rebounds. Even a double-double of 28 points, 15 rebounds and 5 assists by Polish-Swedish power forward Maciej Lampe (211-85) did not help to save the game for Jilin Tigers. American guard Dominique Jones (193-88, college: S.Florida) added 23 points, 8 rebounds and 8 assists for lost side. Four Jilin Tigers players scored in double figures. Both coaches used bench players and allowed the starting five to rest. Long-Lions maintains tenth position with 8-7 record, which they share with Fujian S. Loser Jilin Tigers keep the twelfth place with eight games lost. Long-Lions will meet league's second-placed Beijing Ducks on the road in the next round and they do not belong to the favorites in that game. Jilin Tigers will play against Eagles (#16) and hope to secure a win. No shocking result in a game when fourth ranked Beijing Ducks (11-4) beat 15th ranked Eagles (4-11) in Qingdao 107-92 on Wednesday. Strangely Eagles outrebounded Beijing Ducks 47-34 including 34 on the defensive glass. They looked well-organized offensively handing out 23 assists comparing to just 8 passes made by Eagles' players. The winners were led by American guard Aaron Jackson (190-86, college: Duquesne) who scored that evening 27 points and 6 assists and the former international forward Xiaochuan Zhai (205-93) supported him with 24 points and 5 rebounds (on 10-of-13 shooting from the field). Five Beijing Ducks players scored in double figures. Even 35 points (!!!) and 6 rebounds (made all of his seventeen free throws !!!) by American point guard Jonathan Gibson (188-87, college: N.Mexico St.) did not help to save the game for Eagles. His fellow American import power forward Dakari Johnson (213-95, college: Kentucky) added 23 points and 11 rebounds for lost side. Both coaches used bench players and allowed the starting five to rest. Beijing Ducks have an impressive nine-game winning streak. They moved-up to second place, which they share with Liaoning FL and Shanghai S. Loser Eagles keep the fifteenth position with 11 games lost. They share it with Shanxi Z.. Beijing Ducks will meet at home Long-Lions (#11) in the next round and are hoping to win another game. Eagles will play against Jilin Tigers (#12) in Changchun and hope to secure a win. Very expected game when 17th ranked Bayi Rockets (3-12) lost to eighth ranked Golden Stars (9-6) in Jinan 86-97 on Wednesday. The winners were led by American guard Andrew Goudelock (190-88, college: Charleston) who scored that evening 30 points and 8 rebounds and Lithuanian power forward Donatas Motiejunas (213-90) supported him with 17 points and 8 rebounds. Even 18 points and 6 assists by the former international guard Shuo Han (196-86) did not help to save the game for Bayi Rockets. Aersilan Azat added 19 points and 4 assists for lost side. Four Golden Stars and five Bayi Rockets players scored in double figures. Both coaches used bench players and allowed the starting five to rest. Despite that victory Golden Stars went down to ninth position due to points difference. Bayi Rockets lost sixth consecutive game. They keep the seventeenth place with 12 games lost. They share the position with Sichuan BW and Beijing Dragons. Golden Stars will meet at home Fly Dragons (#19) in the next round and are hoping to win another game. Bayi Rockets will play against Leopards and hope to secure a win. Very predictable result when fourth ranked Beijing Ducks (11-4) won against 17th ranked Blue Whales (3-12) in Sichuan 87-73 on Friday. Beijing Ducks looked well-organized offensively handing out 21 assists. The winners were led by the former international forward Xiaochuan Zhai (205-93) who scored that evening 18 points, 9 rebounds and 5 assists and Croatian-American center Justin Hamilton (213-90, college: LSU) supported him with 22 points and 9 rebounds. Four Beijing Ducks players scored in double figures. Even a double-double of 21 points, 16 rebounds and 8 assists by American Jamaal Franklin (196-91, college: San Diego St., agency: Slash Sports) did not help to save the game for Blue Whales. His fellow American import power forward Jason Thompson (211-86, college: Rider) added 21 points and 9 rebounds for lost side. Both coaches used bench players and allowed the starting five to rest. Beijing Ducks have an impressive nine-game winning streak. They moved-up to second place, which they share with Liaoning FL and Shanghai S. Blue Whales lost ninth consecutive game. They keep the seventeenth position with 12 games lost. They share it with Bayi R. and Beijing Dragons. Beijing Ducks will meet at home Long-Lions (#11) in the next round and are hoping to win another game. Blue Whales will play against Jiangsu Dragons (#13) in Nanjing and hope to secure a win. Not a big story in a game when 20th ranked Gold Lions (2-13) were outscored by ninth ranked Zhejiang Guangsha Lions (9-2) in Hangzhou 125-103 on Friday. Zhejiang Guangsha Lions outrebounded Gold Lions 54-39 including 19 on the offensive glass. They looked well-organized offensively handing out 30 assists. The winners were led by American point guard Courtney Fortson (180-88, college: Arkansas) who had that evening a double-double by scoring 32 points, 9 rebounds and 12 assists and Greek center Ioannis Bourousis (214-83) supported him with 24 points, 15 rebounds and 11 assists. Even a double-double of 26 points, 24 rebounds, 5 assists and 5 steals by American center Cole Aldrich (211-88, college: Kansas) did not help to save the game for Gold Lions. 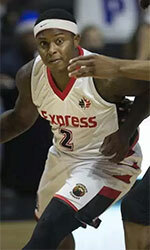 Guard DeShuai Shi (192-92) added 24 points and 6 rebounds for lost side. Four Zhejiang Guangsha Lions and five Gold Lions players scored in double figures. Since the result was very predictable, it gave the chance for the coaches to test many bench players and allowed the starting five to rest. Zhejiang Guangsha Lions moved-up to eighth place. Gold Lions lost eighth consecutive game. They stay at the bottom position with 13 games lost. Zhejiang Guangsha Lions' supporters look forward to an exciting derby game next round, where their team will travel locally in Hangzhou to the arena Golden Bulls. Al-Manama (Premier League) agreed terms with 33-year old Polish international power forward Maciej Lampe (211-122kg-85) to represent the club in Arab Gulf Championship. He is a dual citizen owning also Swedish passport. Lampe started the season at Jilin Northeast Tigers in Chinese CBA league. In 45 games he had very impressive stats: 24.4ppg, 13.3rpg and 3.4apg this season. The last season he played at Eagles (also in CBA) where in four games he recorded also remarkable stats: 24.3ppg, 13.8rpg, 2.0apg, 2.0spg and 1.3bpg. In 2003 Lampe was drafted by New York Knicks (NBA) in second round (30th overall). The list of the past achievements is quite long as among others he won Spanish Liga Endesa championship title in 2014. Lampe was also voted Eurobasket.com All-Spanish ACB Newcomer of the Year back in 2012. He has been also a member of Polish international program for some years. Lampe has regularly played for Polish senior team since 2004 and previously for U18 National Team between 2001 and 2002. He represented Poland at the Qualifications to European Championships 2017 three years ago. His stats at that event were 5 games: 14.6ppg, 7.4rpg, 1.4apg, FGP: 54.0%, 3PT: 20.0%, FT: 84.2%. Lampe is quite experienced player. His career allowed him to visit three different continents, while he played in six different countries. Lampe tasted the life as pro basketball player in Europe, Asia and of course North America. He has played previously professionally also in Israel (Maccabi Fox Tel-Aviv), Russia (Unics Kazan, Khimki and Dynamo Sankt Petersburg), Turkey (Besiktas), NBA (New Orleans Pelicans, Houston Rockets and Phoenix Suns) and Spain (FC Barcelona and Baskonia). Improves every day; he can play three positions, but hes probably best at the PF; his combination of size, shooting touch, ball handling skills and an advanced inside-outside games have drawn comparisons to Dirk Nowitzki; in fact, hes a great leaper, has great instinct for the offensive rebounds, moves well without the ball, has enough soft hands to develop a good outside shoot.